Somewhat overshadowed by nearby Gmunden, the town of Altmünster has less to offer in terms of sightseeing - yet it is among the most touristy places in the region (which, for the Salzkammergut, means quite something). With the town centre not being as appealing as in other towns in the surroundings, Altmünster found its niche in water- and mountain sports. The economy of the approximately 10,000 residents heavily depends on tourism. The history of Altmünster can be tracked back to settlements in Neolithic times. The oldest written record of a monastic site ("monasterium Trunseio") dates back to 909, but it probably refers to the monastery in nearby Traunkirchen. Originally, the entire region around the Lake Traunsee was part of the Duchy of Bavaria and religiously under control of the Archbishops of Salzburg. In 1490 it became part of Austria, more specifically the Principality of "Österreich ob der Enns". Nothing much happened during the centuries that followed, until during the Napoleonic Wars, Altmünster was occupied by French-Bavarian troops on several occasions. In 1850, Altmünster became an independent community, gearing up for the rise of tourism in the region. Since 1918, it is part of the province of Upper Austria. In terms of sightseeing, the limited opportunities include a lakeside promenade and a few buildings of interest. The Gothic parish church has a distinct tower made of stone, which, unlike most churches in Austria, has no façade. The interiors are a typically Austrian mix of Gothic, Baroque and even later styles. The churches main attraction is the Allerheiligenaltar or "Altar of All Saints". It is a 16th century limestone altar in a side-chapel of the nave and a remarkable piece of alpine Renaissance craftsmanship. This chapel also contains the tomb of the Count of Herberstorff. Fighting in the "Bauernkriege" (a more or less loosely connected series of conflicts between social riots and protestant uprisings that took place all over Austria between roundabout 1500 and 1650), the Count of Herberstorff defeated a peasant army in nearby Frankenburg in 1620. The peasants surrendered to his mercy - but the count divided them into couples and made them roll dice. The loser was hung at the spot. This episode is known in Austria as the "Frankenburger Würfelspiel" ("Frankenburg Dice Games") and sometimes performed in historic costumes. There are various of the typical Salzkammergut villas in Altmünster, the most elaborate one being the neo-Classical Schloss Ebenzweier. Next to this building, you can find the local "Zweiradmuseum" or "Museum of two-wheeled vehicles". The exhibition consists of a wild array of bicycles, scooters and motorbikes. 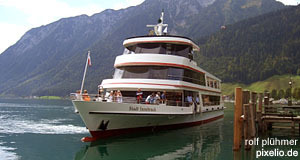 Other attractions nearby include the previously mentioned Gmunden, Traunkirchen, Ebensee with a KZ memorial site and the surroundings of Lake Traunsee. The tiny but beautiful Langbathsee Lakes make a great and easy hike particularly nice in early autumn. Bad Ischl and a bit further north the Lake Attersee are relatively close, too.